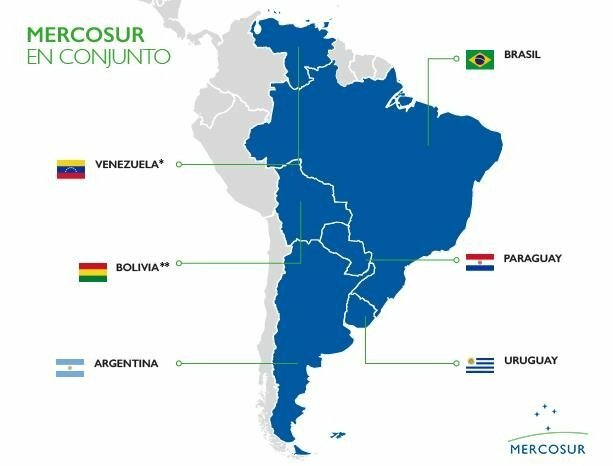 MERCOSUR is a customs union created in 1991, originally formed by Argentina, Brazil, Paraguay, Uruguay and joined later on by Venezuela* (suspended) and Bolivia**. Its official languages are Spanish and Portuguese. MERCOUSR is the fifth largest economy in the world. The size of the territory is of 14.869.775 km² and it has a total population of approximately 295.007.000. Since its creation, its primary objective has been to foment investment and trade between its member states as well as to integrate the local economies in the international market and international supply chains. Other objectives of MERCOSUR are the cultural and social integration of the diverse communities which reside in the different countries within the bloc. In order to achieve these goals, MERCOSUR countries have expanded freedom of movement for all its citizens allowing them to travel with the use of an ID card only. Also, as part of the Integrated Education Protocol, all member states recognize primary and secondary education certificates from other MERCOSUR states, with the aim of allowing all citizens to complete their studies in any member state. * In 2017 the Bolivarian Republic of Venezuela was suspended from all its rights and obligations as a member state of the treaty, as stated in Article 5 of the Ushuaia Protocol. ** The Plurinational State of Bolivia is still in the stage of the Protocol of Accession. As established in Article 1 of the "Protocol of Ouro Preto", there are three fundamental bodies within MERCOSUR: Common Market Council, the Common Market Group and the MERCOSUR Trade Commission. There are also more than 300 other forums that are made up of representatives from all member states. It is a body above all other MERCOSUR institutions. Its members are the Ministers of Foreign Affairs of each country and all Economics and Finance Ministers (or equivalent). The job of the Council is to make sure that the political objectives of the bloc are met. It is the executive body of MERCOSUR. It is integrated by five alternating members and five permanent members per country. These representatives are assigned by their respective governments. The body must inform all Foreign Secretaries, Ministers for Economy and Finance (or equivalent) and all Central Banks. The GMC meets at least once every three months to guarantee that rules and regulations are being properly applied. It is in charge of assisting the Common Market Group on establishing rules and regulations for trade between MERCOUSR members and third parties. It is also in charge of assisting other MERCOSUR bodies and forums in gathering statistics and information about the common market. · What are those exports? Seeds and oleaginous, fruits (13%, 31.8 billion US$), metal ores (9%, 22.7 billion dollars), hydro-carbon based fuels and mineral oils (7.4%, 18.8 billion US$), meats and edible offal (7.2%, 18.2 billon US$). · What are those imports? Electrical machines and their parts (30.6 billion US$, 16%), hydro-carbon based fuels and mineral oils (14%, 27.7 billion US$), nuclear reactors and other machinery (13%, 26.5 billion US$), cars and other vehicles (6.5%, 12.7 US$). Total Trade between Canada and MERCOSUR was 6.6 billion US$ in 2017. The bloc exported 4.1 billion US$ worth of goods while it imported 2.5 billion US$ from Canada. March 9, 2018 - Asunción, Paraguay - Ministers of the Mercosur member states, Jorge Marcelo Faurie, Argentina’s Minister of Foreign Affairs and Worship; Aloysio Nunes Ferreira, Brazil’s Minister of Foreign Affairs; Marcos Jorge de Lima, Brazil’s Minister of Industry, Foreign Trade and Services; Eladio Loizaga, Paraguay’s Minister of Foreign Affairs; and Rodolfo Nin Novoa, Uruguay’s Minister of Foreign Affairs, met with the Honourable François-Philippe Champagne Canada’s Minister of International Trade, on March 9, 2018, in Asunción. The ministers agreed to launch negotiations toward a comprehensive Canada-Mercosur free trade agreement (FTA). This represents a significant step toward deepening the important relationship between the Mercosur member states and Canada. The ministers underscored the opportunity a comprehensive, progressive and commercially meaningful FTA presents for the mutual benefit of Canada and Mercosur. Strengthening ties through enhanced trade and investment flows is an integral step toward a shared interest in sustainable prosperity and a shared commitment to trade liberalization and open markets. The ministers recognized the importance of advancing this initiative in an inclusive manner. Mercosur and Canada will seek to negotiate issues such as market access for goods and services, labour, the environment, trade and gender, micro-, small and medium-sized enterprises, among others. Integrating these elements will reinforce a collective commitment to lasting economic growth and development for all people. The ministers committed to pursue negotiations of an FTA in order to bring opportunities to the people of Canada and Mercosur without delay and have instructed officials to hold the first round of negotiations in Ottawa, Canada, from March 20 to 23, 2018.